জেনারেল জিয়াকে বন্দী করার সময় একটা সাদা কাগজে কর্নেল রউফের মাধ্যমে জেনারেল জিয়ার সই করিয়ে নিয়েছিলেন ব্রিগেডিয়ার খালেদ। খবরটা জানা থাকায় ২-৩ রা নভেম্বর রাতে ৪র্থ ইস্টবেঙ্গল-এ পৌঁছেই খালেদ ভাইকে প্রশ্ন করেছিলাম শুধুমাত্র চীফ হবার বাসনায় এ জাতীয় বিশ্বাসঘাতকতা কি করে করতে পারলেন একজন মুক্তিযোদ্ধা হিসেবে খালেদ ভাই? তুমি কি মনে করো আমি চীফ হবার লোভেই এখানে এসেছি? ১। প্রেসিডেন্ট, বঙ্গবীর জেনারেল ওসমানী এবং জেনারেল খলিলুর রাহমান কেনো পদত্যাগ করতে বাধ্য হলেন? ২। সেনাপ্রধান জেনারেল জিয়াকে কেনো গৃহবন্দী করে রাখা হচ্ছে? ৩। আগস্ট বিপ্লবের নেতারা দেশ ছেড়ে চলে গেলেন কেনো খালেদ-চক্রের সাথে ঘটনার রাত এবং পরের সারাদিন আলোচনার পর? ৪। সংবিধান স্থগিত করে মন্ত্রিপরিষদ ও সংসদ কোন আইনে বাতিল করে সায়েমকে রাষ্ট্রপতি বানিয়ে ব্রিগেডিয়ার খালেদ নিজেকে পদোন্নতি দিয়ে চীফ হয়ে বসলেন? ৫। খালেদের মা আর ভাই রাশেদ মোশাররফের নেতৃত্বে আওয়ামী-বাকশালীদের বিজয় মিছিল কিসের আলামত? ৬। ভারতের সাহায্যে দেশে আবার একদলীয় স্বৈরশাসন কায়েম করাই কি খালেদ-চক্রের উদ্দেশ্য? ৭। জাতীয়স্বার্থ বিরোধী এই চক্রান্তের বিরুদ্ধে আর একবার গর্জে উঠতে হবে দেশপ্রেমিক সামরিক বাহিনীকে এবং জনগণকে। এ ছাড়া অন্য কোনও বিকল্প আছে কি? ৮। ধর্মকর্ম কি আবার হুমকির মুখে পড়বে? What was happening at mid night 12’o clock in the Banga Bhaban? The successfull revolution had taken place. Newly self appointed Gen. Khaled mosharrof was busy in meeting with his confidants Col. Shaffayet Jamil Dhaka 46 Bdge commander, Col. Rauf, Col. Nuruzzaman Ex DG Rakkhi Bahini, Maj. Malek, Col. munnaf, Col. Nazmul Huda, Maj. hayder, Maj. hafiz and khaled’s brother in law Mr. K.Q. Huda. discussing on different matters. suddenly, the phone next to Gen. Khaled. he picked up the receiver. It was Ruby Bhabi who had called. Khaled learned all the units of Dhaka cantonment had revolted. armed soldiers are spreding all over the cantonment, the tracer rounds were illumunating the sky and noise of firing were heard from all direction alongwith thundering anti Khaled different revolutionary slogans. After hearing this Khalad goy scared and worried. He informed his confidants that some people ar trying to stage a counter coup! Khaled ordered Maj. Hafiz to the cantonment to see what is gong on but Hafiz was in dilema. Meanwhile khaled and rest of the officers heard the noise of the rolling Tanks. Maj. Malek instantly called his wife in the cantonment. begum Sahiba in sobbing chocked voice said a fearfull incident has taken place! The whole cantonment had revolted and angry armed soldiers and officers are looking for Gen. Khaled Musharrof and his associates. Hearing the news Maj. malek’s face became pale and the hand set drpped from his hand started swinging. Everybody anxiously wanted to know what happened? Sheet scared trembling Maj. Malek said an armed revolutionary uprising has taken place against Gen. Khaled and angry revolutionaries are looking for Kaled and his associates! As he finished everyone present realized the table has been turned against them. So all started running helter and scalter to save their lives. Gen. Khaled along with his bossom friend Col. huda, Maj. Hayder and KQ Huda fled from the Banga Bhaban hurriedly in a private car. they went to a reletive’s house at Kala Bagan and changed into Civis. They decided to take a plane of the flying club and go to India. KQ Huda was then a proffessional instructor of the flying club. As they approached up to farm gate, they saw Trucks loaded with juvilent armed revolutionary soldiers, Tanks and stream of people on the road chanting revolutionary anti Khaled slogans. The sight was so scary that their moral got shattered and being frustrated they changed their mind and decided to head towards 10East Bengal Regt which had been a part of ‘K’ force under the command of Gen. Khaled during the liberation war in ’71. It was then camped at the Sher e Bangla Nagar. They thought they would get a safe refuge there. But the destiny was not favorable! 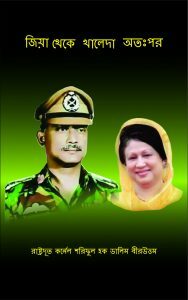 The armed forces of Bangladesh had been raised with the freedom fighters. To them the interest of the country and the nation has always been of supreme consideration not any individual’s interest. Our liberation war had shattered man made all class barriers. Thus the whole nation got united as one disregarding all class differentiations. This allowed the opportunity to all freedom fighters to know each other closely. During the war the worth of any person was never judged by his rank or position. It used to be judged by his character, patriotism, morality, courage, love for the cofighters and sincere fellow feelings. The daring commander Khaled, heroic guerrilla commander Hyder, sub sector commaner Najmul Huda of ’71 are running here and there to get a safe refuge! But failed to get any. Khaled and his companions were pathetically killed in the hands of the troops of the same very 10East Bengal Regt, What a irony of fate! By 1AM the revolutionaries captured the Banga Bhaban. Col. Shafayet and Maj. Hafiz while fleeing by scaling the high walls of Banga Bhaban, Col Shafayet broke his leg. With the broken leg both somehow managed to Munshi Ganj but there both were caught by the angry mob and they were apprehandeed to the local authorities. Those who came to attend the formation commander’s meeting called by the new Chief Gen. Khaled Musharrof and were staying in the VIP guest house started running for their lives senselessly in every direction. Some in sleeping suite, some in Lungi or even just underware. Those who took the side of Gen. Khaled sensing the wind also started fleeing from the cantonment with their wives and children senselessly in whatever direction they could manage. Why have you stoped the car? Drive fast. Arrage pertrol and catch me on the road. I am going ahead. He got down from the car and started running towars his village home. As the car had suddenly stoped Maj. Malek became apprehensive that his driver is going to kill him. After running some distance bulky Maj. Malek felt his trouser was getting wet with warm water coming out from his lower organ due to stress and strain. But he could not careless and continued running and managed to save his life reaching his ansestral home completely exhausted and almost half dead. Later the villagers forced him to surrender to the local authorities. After the independence the foundation of the Bangladesh armed forces was based on the freedom fighters. Therefore, the spineless and weak charactered Generals could hardly earned required loyalty and command over his subordinate officers and the soldiers. Particularly, most of the repatriated officers who were trained to consider themselves superior from the other ranks and files used to maintain a distance from the other ranks to protect the vested interests of the rulling class. Many of them could not change this attitude and therefore, they failed to earn due regard and respect from the freedom fighter members of the armed forces. When Gen. Ershad was the president I was called once by him for consultation. I became quite close to Maj. Malek as we served togather in Quetta. He had also helped us to escape to some extent. I have pened down in details about that in my book ‘Ja dekhechi Ja bujhechi Ja korechi’. In English ‘The Untoled facts’. He then was the Mayor of Dhaka as a confidant and an old buddy of Gen. Ershad. He came to know that the President himself had called me to Dhaka for consultation. That could be an added reason he invited me and my wife over a dinner at his residence. That night while revisiting good old memories of Quetta days he narrated himself his experience of 7th November to us.